There’s no Chrysler dealership in Kalamazoo. Is it just me or is that odd? A few weeks ago, I went to look up the local dealership, so I could go get an oil change. Didn’t find one in town, but I did find one in Vicksburg, so I set up an appointment. I headed out to Vicksburg Chrysler, Dodge, Jeep to get the service done. Afterwards, I decided to explore a little more of Southwest Michigan. Instead of taking Portage Road home, I headed west to pick up 131. When I got to Schoolcraft, I headed downtown to see what was there. As I was driving down Grand Street, I had to do a double take. Did that sign say BBQ? It sure did. 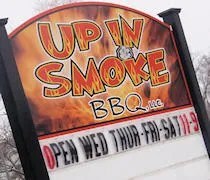 Up in Smoke BBQ is just on the edge of downtown Schoolcraft on Grand Street between Cass and Clay Streets. It’s a very plain looking building, but the sign near the road really makes it jump out. There was only one other car in the parking lot, but it was almost four in the afternoon. Not quite lunch time. Not quite dinner. The set up is somewhat cafeteria style. You don’t get your own food, but it’s all laid out in front of you in hotel pans. There was one guy behind the counter doing a crossword puzzle and watching the History Channel. He jumped up to greet me when I walked in. The menu is written on a dry erase board on a wall behind the food. J and I are huge pulled pork fans, so that was all I really looked at. They only do their pulled meats on sandwiches, so I got two. J had no idea I was stopping for food, but I knew she’d be happy when I came home with some ‘Cue. There are a few tables if you wanted to stay and eat, but I’m gonna guess most of the business is done carry-out style. When I asked for two pulled pork sandwiches, I was asked how I wanted them packaged up. I thought this was a great idea. He asked if I wanted to keep the meat and the bread separate. Since he offered, I jumped at the chance. It would keep the bun from getting soggy on the way home. Since I ordered two sandwiches, he also asked if I wanted the meat in separate containers. I said no. Putting it all together was fine. After putting a a mound of meat into a styrofoam take out box, he packaged up the buns and added a couple cups of sauce to a bag. The two sandwiches cost a little over $10 which sounds high, but I think I made out better by not having the sandwiches made there. When I got home, J was happy to see I found a BBQ place and even happier than I chose to bring her a sandwich instead of just getting one for myself. We sat down and divided up the meat between the two buns and dug in. The meat was already sauced which isn’t something I’m a fan of. I really prefer the meat to be served naked. It just seems like it gets a funky taste when it stews in BBQ sauce. 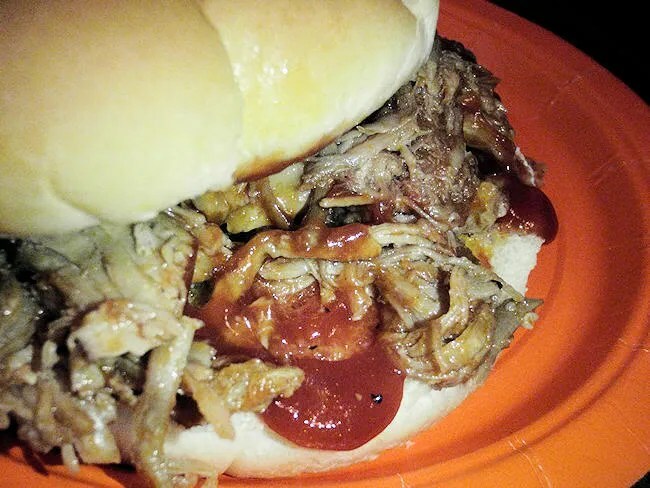 We both ended up putting the extra sauce on the meat which made the sandwich delicious. There wasn’t a whole lot of sauce, but it was a sweet, smokey, Memphis style sauce. It’s one of those sauces that you can just drink. I thought the meat was pretty good and definitely hand pulled. J called it a little meaty. I mentioned earlier that we probably made out better by not having the sandwiches made at the shop. Why did I mention that? Because we had extra meat. After we made both sandwiches, there was still quite a bit left, so I scrapped out what sauce was left in the two cups and dug in with a fork. Up in Smoke was a completely suprising find in Schoolcraft. Since moving to Michigan, finding good BBQ has been one of my biggest complaints. 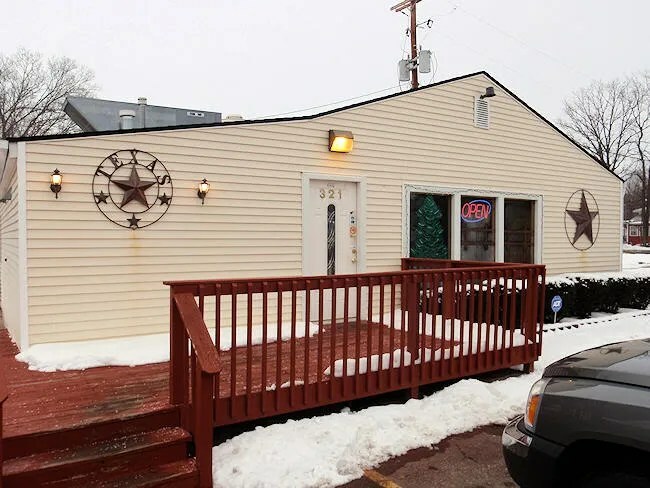 The drive to Schoolcraft isn’t all that far and is worth it to fix that BBQ craving. Too bad the Schoolcraft Up in Smoke closed last year. But Nathan still operates his “mobile BBQ” around S.W. MI!